From clinical studies and animal models, scientists have noticed that some obese individuals can maintain a remarkable capacity to store fat before experiencing adverse metabolic effects associated with obesity, such as insulin resistance and Type 2 diabetes. It seems that the adipose tissue of these people has developed adaptive mechanisms that allow it to preserve its functionality while adjusting its biochemical features to maintain its biophysical characteristics. In our study, we looked at SREBP1, a key regulator of lipid metabolism. It regulates the expression of genes important for triglyceride storage, de novo fatty acid synthesis and synthesis of specific lipids species among other processes. We observed that the transcription factor SREBP1 is often more active in individuals who are obese but otherwise healthy, with a level of insulin sensitivity that is similar to lean subjects. SREBP1 together with Insig1, a factor that controls the post-translational cleavage and maturation of SREBP1 protein and SCD1, a SREBP1 target gene responsible for the maintenance of lipid unsaturation, play a leading role in these adaptive responses in adipose tissue. In our work, we looked at how this mechanism works in rodent models of genetic-induced obesity, and also, rodent and human models of diet-induced obesity. In addition, we validated our findings in cellular and mouse models deficient for Insig1 expression. 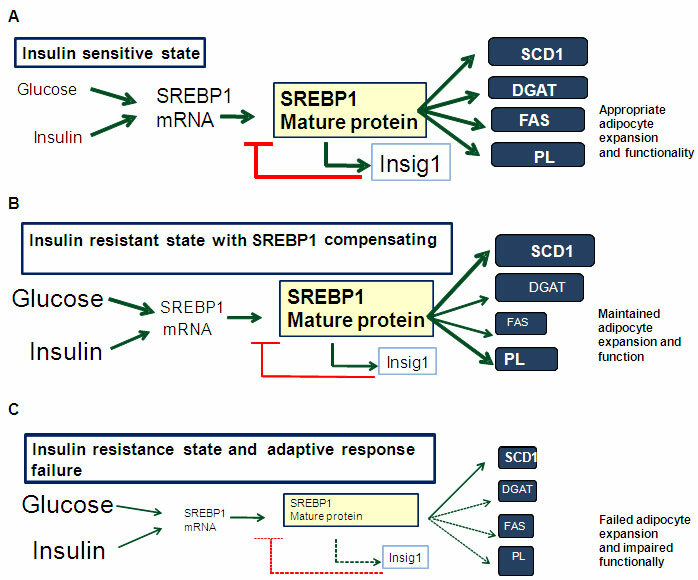 Based on this, we propose a three-stage hypothetical model of Insig1/SREBP1 SCD1 adaptive response in adipose tissue describing the evolution from insulin sensitive states to obesity-induced insulin resistance and final metabolic failure. The second stage describes a situation in which, as a consequence of their obese state, an individual develops additional metabolic complications such as insulin resistance. This leads to an increase in the amount of insulin present in his blood in attempt to control the increased levels of circulating glucose. In this scenario, the adipose tissue of this subject activates adaptive responses that allow the preservation of its functionality. Specifically, this compensatory mechanism is characterised decreased Srebp1 mRNA levels in adipose tissue. Moreover, maintenance of adequate SREBP1 cleavage requires progressive optimisation through a decrease of the Insig1 set point, illustrated by decreased gene and protein expression. Under these conditions, SCD1 is the most efficiently maintained gene target and results in an enrichment of unsaturated lipid species in adipose tissue (This stage is shown in Fig 1B). The third stage occurs when excessive fat deposition and insulin resistance, leading to diabetes, result in failure of the adaptive compensation of the adipose tissue to cope with disproportionate demands to expand. In this situation, the decrease in Insig1 in adipose tissue is insufficient to maintain a minimum level of SREBP1 activity and as a consequence SCD1 expression is unable to maintain lipid homeostasis (This stage is shown in Fig. 1C). Understanding the mechanisms that allow human adipose tissue to maintain its functionality in situations of metabolic stress is essential. This research, in addition to our previous research into brown adipose tissue activation (see previous blog, ‘Fighting Fat with Fat’), could help to develop new potential strategies to prevent and treat obesity and its associated complications.